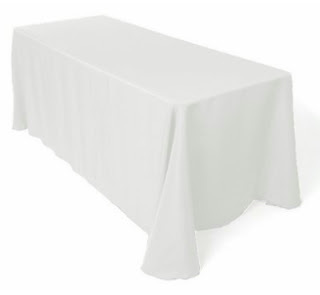 Daily Cheapskate: PRICE DROP: 60" x 126" solid white tablecloth for $8.71 on Amazon. A SUKKOT MUST-HAVE! PRICE DROP: 60" x 126" solid white tablecloth for $8.71 on Amazon. A SUKKOT MUST-HAVE! I've been waiting for a price drop on this one. This is one of the best Amazon deals around, especially for an upcoming YomTov that is replete with large, messy outdoor meals and laundering restrictions! Amazon has got this 60" x 126" solid white tablecloth for only $8.77 with free Prime shipping. I own six of these at this point. These are perfect for 6-foot tables. They are not going to be amongst your finest, softest, shmanciest linens, but they are super-practical, wash up really well, and are very inexpensive. These are my Succos and Pesach go-to tablecloths. Because of these, I don't need to cover my tablecloths with plastic. (I have a friend who buys these and lets her kids scribble on them with crayons and markers, not kidding!) They also don't require ironing (as long as you deal with folding or hanging them right out of the dryer), and you can dress them up very easily with pretty tableware, centerpieces or with a runner.